I don’t know about you, but this spring has been a bit challenging for me. We did a product photoshoot for a client, but other than that, we mostly were not cooking or shooting or doing anything much creative on the blog. It’s been a bit tough, though so much is actually going on behind the scenes! We are so excited about some new upcoming collaborations and can’t wait to show you more easy & delicious spring recipes! 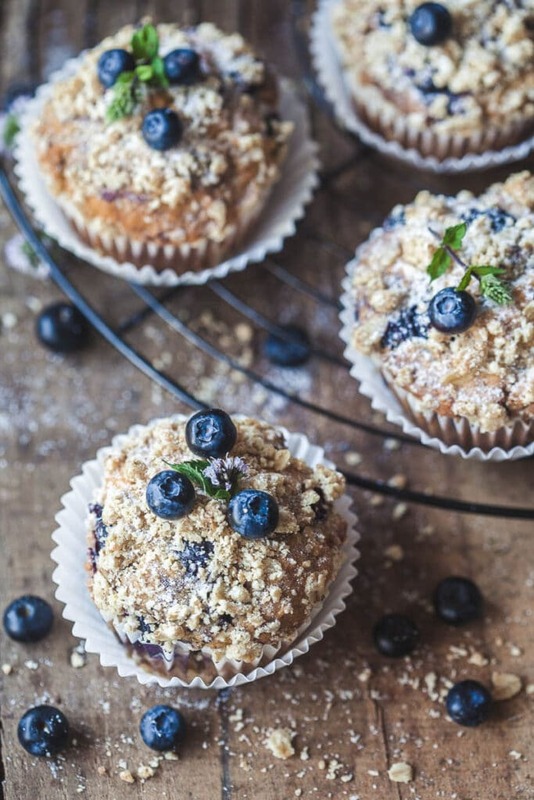 Until then, we’re sharing some delicious Yogurt Blueberry Breakfast Muffins with you! 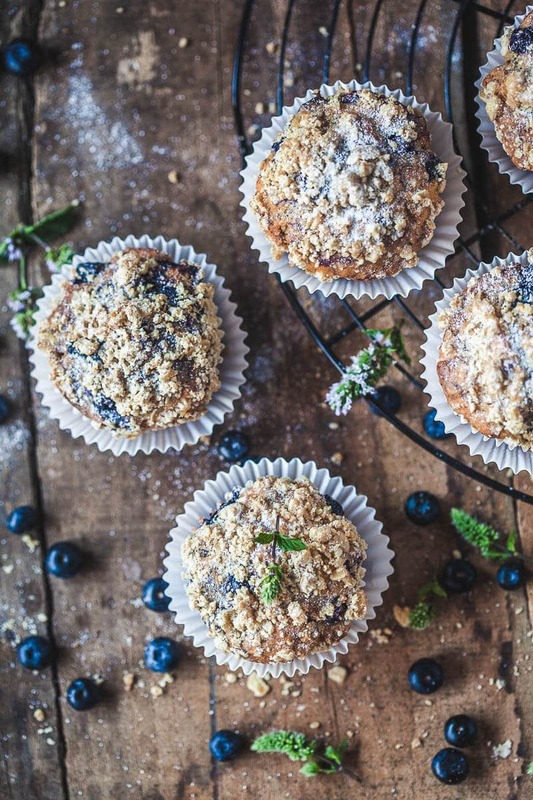 These fluffy muffins are best for a sweet after-lunch coffee treat or when running low on energy, but they are a great breakfast option, too. 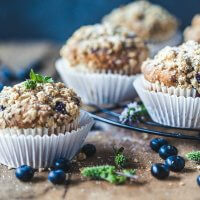 Blueberry Breakfast Muffins are beautifully tender and moist, but not too sweet, and the cherry on top is a delicious oat crumble. Making these cuties will only take a couple of minutes and the hardest part of the recipe is waiting for the muffins to cool down enough to eat them! 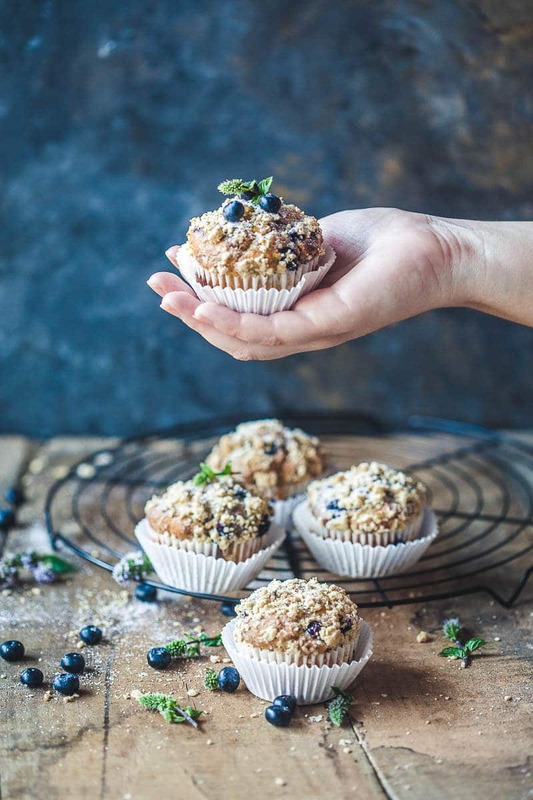 These Yogurt Blueberry Breakfast Muffins are made with sheep milk yogurt by Kmetija Pustotnik, but if you don’t have sheep milk yogurt at hand, just use regular yogurt, greek yogurt or even plant-based yogurt, such as soy or coconut. This recipe is sponsored by Kmetija Pustotnik. 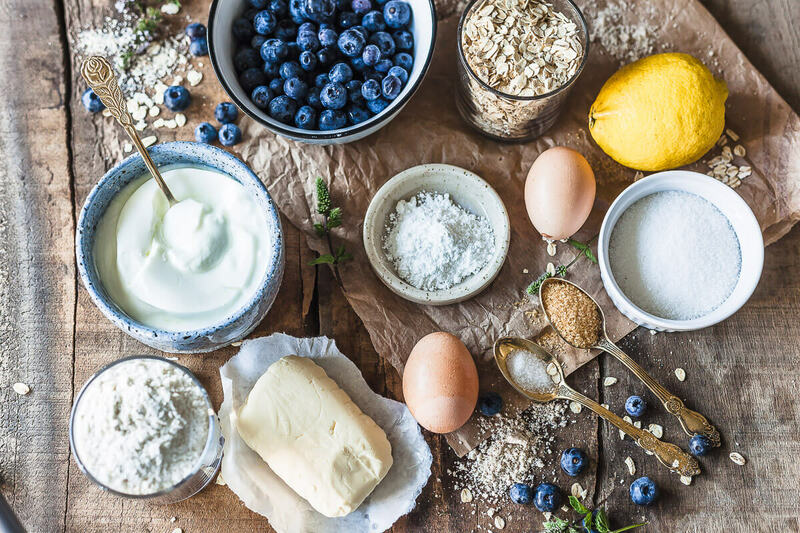 They offer a great selection of high-quality dairy products, such as delicious homemade butter, prized aged cheeses, and goat’s milk products. Be sure to check it out! 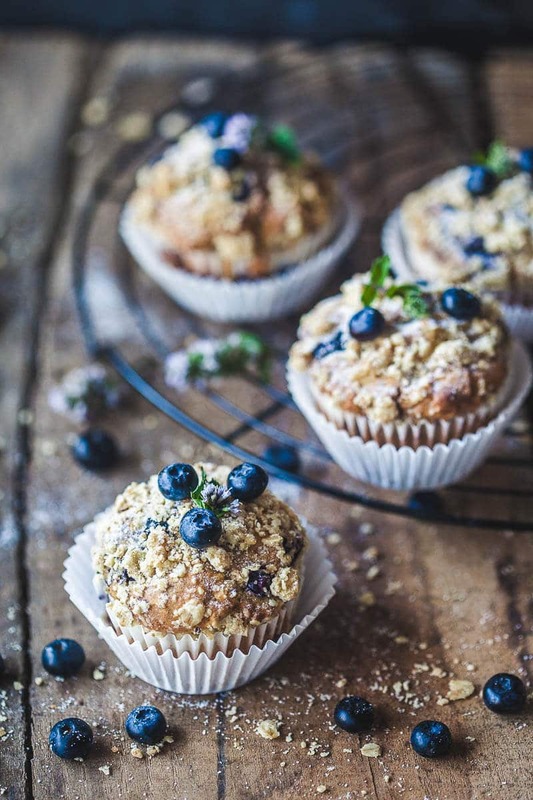 The perfect Yogurt Blueberry Breakfast Muffins, tender and fluffy in the middle, crisp and crunchy on top. Preheat oven to 180°C / 356°F. Layer a muffin tray with paper molds or grease thoroughly. Prepare crumble: place oats in a bowl, add ground almonds, flour and brown sugar. Lastly, add room-temperature butter, cut into small cubes. Start combining with your fingers and mix until you get a mixture that resembles large breadcrumbs. Set aside. In a separate bowl add 1,5 cup of flower, a cup of ground rolled oats, baking powder and a pinch of salt. Combine well. In another bowl, crack open 2 eggs, discard egg shells. Whisk eggs to break them apart, and while whisking pour in melted butter to combine into a fluffy mixture. Add sugar and whisk again. Add yogurt and lemon zest and fold into the mixture with a spatula. Add dry ingredients to wet ingredients and mix gently but thoroughly to combine. Then, add blueberries and fold them carefully into the mixture. Pour muffin mixture into the molds by using a spoon and fill them up to 2/3. Then, take the crumble and sprinkle on top of the muffins. Place muffin tray in a preheated oven and bake 20-25 minutes until the muffins rise and turn golden brown. You can check when they are done by inserting a toothpick into a muffin. If the toothpick comes out clean, your muffins are done! Remove muffins from the oven and set on a rake to cool. Before serving dust with a bit of powdered sugar and some fresh blueberries. PRO TIP: You can substitute sheep yogurt with plain yogurt, greek yogurt or plant-based yogurt. Use fresh or frozen blueberries.